Quick Links: CV, Publications, Software, Teaching, Biography. D. B. Dahl (2019), Integration of R and Scala Using rscala, Journal of Statistical Software, accepted. D. B. Dahl, R. Day, J. Tsai (2017), Random Partition Distribution Indexed by Pairwise Information, Journal of the American Statistical Association, 112, 721-732. Paper, R package, Git repository. Q. Li, D. B. Dahl, M. Vannucci, H. Joo, J. W. Tsai (2016), KScons: A Bayesian Approach for Protein Residue Contact Prediction using the Knob-socket Model of Protein Tertiary Structure, Bioinformatics, 32(24): 3774-3781. Paper, R package, Web app. Q. Li, D. B. Dahl, M. Vannucci, H. Joo, J. W. Tsai (2014), Bayesian Model of Protein Primary Sequence for Secondary Structure Prediction, PLOS ONE, 9(10), e109832. Paper, R package, Web app. Git repository. R. Day, H. Joo, A. Chavan, K. P. Lennox, Y. A. Chen, D. B. Dahl, M. Vannucci, J. Tsai (2013), Understanding the General Packing Rearrangements Required for Successful Template Based Modeling of Protein Structure from a CASP Experiment, Computational Biology and Chemistry, 42, 40-48. Paper. S. Schwartz, I. Friedberg, I. V. Ivanov, L. A. Davidson, J. S. Goldsby, D. B. Dahl, D. Herman, M. Wang, S. M. Donovan, R. S. Chapkin (2012), A Metagenomic Study of Diet-Dependent Interaction Between Gut Microbiota and Host in Infants Reveals Differences in Immune Response, Genome Biology, 2012, 13:r32. Paper. A. G. Chavan, H. Joo, R. Day, K. P. Lennox, P. Sukhanov, D. B. Dahl, M. Vannucci, and J. W. Tsai (2011), Near-Native Protein Loop Modeling using Nonparametric Density Estimation Accommodating Sparcity. PLoS Computational Biology, 7(10): e1002234. Paper. R. Day, K. P. Lennox, D. B. Dahl, M. Vannucci, and J. W. Tsai (2010), Characterizing the regularity of tetrahedral packing motifs in protein tertiary structure. Bioinformatics, 26, 3059-3066. Paper. K. P. Lennox, D. B. Dahl, M. Vannucci, R. Day, J. W. Tsai (2010), A Dirichlet Process Mixture of Hidden Markov Models for Protein Structure Prediction, Annals of Applied Statistics, 4, 916-962. Paper. Publisher's Link. Website. S. Kim, D. B. Dahl, M. Vannucci (2009), Spike and Slab Dirichlet Process Prior for Multiple Hypothesis Testing in Random Effects Models, Bayesian Analysis, 4, 707-732. Paper. L. Tao, D. B. Dahl, L. M. Perez, D. H. Russell (2009), The Contributions of Molecular Framework to IMS Collision Cross-sections of Gas-phase Peptide Ions, Journal of the American Society for Mass Spectrometry, 20, 1593-1602. Paper. D. B. Dahl (2009), Bayesian Methods for Protein Structure Prediction: Annoted Bibliography, ISBA Bulletin, 16(2), 6-8. Bulletin. K. P. Lennox, D. B. Dahl, M. Vannucci, J. W. Tsai (2009), Density Estimation for Protein Conformation Angles Using a Bivariate von Mises Distribution and Bayesian Nonparametrics, Journal of the American Statistical Association, 104, 586-596. Paper with correction and supplement. D. B. Dahl (2009), Modal Clustering in a Class of Product Partition Models, Bayesian Analysis, 4, 243-264. Paper. Website. D. B. Dahl, S. Crawford (2009), RinRuby: Accessing the R Interpreter from Pure Ruby, Journal of Statistical Software, 29(4), 1-18. Paper. Software and website. D. B. Dahl (2008), Distance-Based Probability Distribution for Set Partitions With Applications to Bayesian Nonparametrics, in JSM Proceedings, Section on Bayesian Statistical Science, Alexandria, VA: American Statistical Association. Paper. D. B. Dahl, Z. Bohannan, Q. Mo, M. Vannucci, J. W. Tsai (2008), Assessing Side-Chain Perturbations of the Protein Backbone: A Knowledge Based Classification of Residue Ramachandran Space, Journal of Molecular Biology, 378, 749-758. Personal version, Publisher's version. D. B. Dahl, Q. Mo, M. Vannucci (2008), Simultaneous Inference for Multiple Testing and Clustering via a Dirichlet Process Mixture Model, Statistical Modelling, 8, 23-39. Paper, slides of talk, video of talk (ogg/theora), video of talk (mpeg-4) (from Third Erich L. Lehmann Symposium). D. B. Dahl, M. A. Newton (2007), Multiple Hypothesis Testing by Clustering Treatment Effects, Journal of the American Statistical Association, 102, 517-526. Paper, see also the slides and video for paper above. D. B. Dahl (2007), Discussion of Jain and Neal's "Splitting and Merging Components of a Nonconjugate Dirichlet Process Mixture Model," Bayesian Analysis, 2, 473-478. Paper, discussion, and rejoinder. D. B. Dahl (2006), Model-Based Clustering for Expression Data via a Dirichlet Process Mixture Model, in Bayesian Inference for Gene Expression and Proteomics, Kim-Anh Do, Peter Müller, Marina Vannucci (Eds. ), Cambridge University Press. Paper. Software implementing least-squares clustering. D. Kwon, S. Kim, D. B. Dahl, M. Swartz, M. Tadesse and M. Vannucci (2006), Identification of DNA Regulatory Motifs and Regulators by Integrating Gene Expression and Sequence Data, in Bayesian Inference for Gene Expression and Proteomics, Kim-Anh Do, Peter Müller, Marina Vannucci (Eds. ), Cambridge University Press. S. Sengupta, J. A. den Boon, I.-H. Chen, M. A. Newton, D. B. Dahl, M. Chen, Y.-J. Cheng, W. H. Westra, C.-J. Chen, A. Hildesheim, B. Sugden, P. Ahlquist (2006), Genome-Wide Expression Profiling Reveals EBV-Associated Inhibition of MHC Class I Expression in Nasopharyngeal Carcinoma, Cancer Research, 66, 7999-8006. M. A. Croft, A. Glasser, G. Heatley, J. McDonald, T. Ebbert, D. B. Dahl, N. V. Nadkarni, P. L. Kaufman (2006), Accommodative Ciliary Body and Lens Function in Rhesus Monkeys, I: Normal Lens, Zonule and Ciliary Process Configuration in the Iridectomized Eye, Investigative Ophthalmology and Visual Science, 47, 1076-1086. J. A. Mattison, M. A. Croft, D. B. Dahl, G. S. Roth, M. A. Lane, D. K. Ingram, P. L. Kaufman (2005), Accommodative Function in Rhesus Monkeys: Effects of Aging and Calorie Restriction, Journal of the American Aging Association, 27, 59-67. S. Wamsley, B. T. Gabelt, D. B. Dahl, G. L. Case, R. W. Sherwood, C. A. May, M. R. Hernandez, P. L. Kaufman (2005), Vitreous Glutamate Concentration and Axon Loss in Monkeys with Experimental Glaucoma, Archives of Ophthalmology, 123, 64-70. N. Binkley, D. B. Dahl, T. Kawahara-Baccus, D. Krueger, R. J. Colman (2003), Bone Loss Assessment in Ovariectomized Rats Utilizing Two Dual-Energy X-Ray Absorptiometers, Journal of Bone and Mineral Research, 18, 370-375. N. T. Taylor, G. M. Burlingame, K. B. Kristensen, A. Fuhriman, J. Johansen, D. B. Dahl (2001), A Survey of Mental Health Care Provider's and Managed Care Organization Attitudes Toward, Familiarity with, and Use of Group Interventions, International Journal of Group Psychotherapy, 51(2), 243-263. M. Lopez, N. L. Van Zeeland, D. B. Dahl, R. Weindruch, J. M. Aiken (2000), Cellular Phenotypes of Age-Associated Skeletal Muscle Mitochondrial Abnormalities in Rhesus Monkeys, Mutation Research, 452, 123-138.
rscala: Software described in: D. B. Dahl (2017), rscala: Integration of R and Scala, Journal of Statistical Software, revise and resubmit. Paper, R package, Git repository. shallot: Implementation of distributions described in: D. B. Dahl, R. Day, J. Tsai (2017), Random Partition Distribution Indexed by Pairwise Information, Journal of the American Statistical Association, 112, 721-732. Paper, R package, Git repository. kscons: Software implementation of the methods described in: Q. Li, D. B. Dahl, M. Vannucci, H. Joo, J. W. Tsai (2016), KScons: A Bayesian Approach for Protein Residue Contact Prediction using the Knob-socket Model of Protein Tertiary Structure, Bioinformatics, 32(24): 3774-3781. Paper, R package, Web app. bamboo: Software implementation of the methods described in: Q. Li, D. B. Dahl, M. Vannucci, H. Joo, J. W. Tsai (2014), Bayesian Model of Protein Primary Sequence for Secondary Structure Prediction, PLOS ONE, 9(10), e109832. Paper, R package, Web app, Git repository. xtable: An R package to export tabular data into LaTeX and HTML tables. R package. cortorgles: Software implementation of the methods described in: K. P. Lennox, D. B. Dahl, M. Vannucci, R. Day, J. W. Tsai (2010), A Dirichlet Process Mixture of Hidden Markov Models for Protein Structure Prediction, Annals of Applied Statistics, 4, 916-962. Paper. Website. modalclust: Software implementation of the methods described in: D. B. Dahl (2009), Modal Clustering in a Class of Product Partition Models, Bayesian Analysis, 4, 243-264. Paper. Website. RinRuby: Software described in: D. B. Dahl, S. Crawford (2009), RinRuby: Accessing the R Interpreter from Pure Ruby, Journal of Statistical Software, 29(4), 1-18. Paper. Website. dbdexam: LaTeX package and helper program to generate many versions of a multiple choice exam with solutions and answer keys. lsclust: Software implementing the least squares clustering described in: D. B. Dahl (2006), Model-Based Clustering for Expression Data via a Dirichlet Process Mixture Model, in Bayesian Inference for Gene Expression and Proteomics, Kim-Anh Do, Peter Müller, Marina Vannucci (Eds. ), Cambridge University Press. 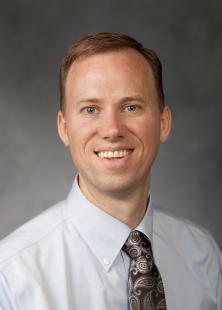 David B. Dahl is a Professor in the Department of Statistics at Brigham Young University. He started his academic career at Texas A&M University as an Assistant Professor in 2004, was promoted to an Associate Professor in 2010, and moved to BYU in 2012. He was promoted to Professor at BYU in 2015. He did doctoral work at the University of Wisconsin -- Madison in the Department of Statistics and the Department of Biostatistics and Medical Informatics under the direction of Michael Newton, receiving his Ph.D. in 2004. He received B.S. and M.S. degrees from Brigham Young University in 1997 and 1998, working on his masters with Scott Grimshaw in the Department of Statistics. During 2007-2012, Dr. Dahl was an adjunct faculty member in the Division of Quantitative Sciences at the University of Texas, M.D. Anderson Cancer Center. David B. Dahl's research interests are Bayesian nonparametrics, model-based clustering, random partition models, protein structure prediction, bioinformatics, and statistical computing. His work has appeared in journals including the Journal of the American Statistical Association, Annals of Applied Statistics, and Bayesian Analysis. He teaches both undergraduate and graduate classes, including Bayesian statistics, statistical methods, and statistical computing.